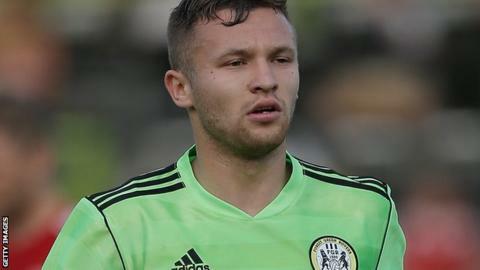 Bristol Rovers stretched their unbeaten run to eight Conference games with a nervy win over struggling Dartford. Matty Taylor's early shot was tipped over by Jason Brown and Neal Trotman fired over for the hosts, while Harry Crawford missed a good Dartford chance. Rovers went ahead when Rory McAuley fouled Adam Cunnington and Taylor's penalty squirmed past Jason Brown. Luke Daley's bullet header struck the bar as Dartford pressed, but Rovers soaked up late pressure to hold on. Darrell Clarke's men have taken advantage of Torquay and Woking's inactivity to move up to fourth in the table, while Dartford drop to 20th. "I was anxious - very, very anxious. Dartford were asking questions at 1-0 because they were still in the game. "But I'm delighted with the three points, especially with Barnet losing as well. "We're now four points off top spot with 15 games played so I'm over the moon. " Match ends, Bristol Rovers 1, Dartford 0. Second Half ends, Bristol Rovers 1, Dartford 0. Attempt saved. Luke Daley (Dartford) header from the centre of the box is saved. Assisted by Ryan Hayes with a cross. Foul by Tom Bender (Dartford). Lee Mansell (Bristol Rovers) is shown the yellow card. Substitution, Dartford. Andy Pugh replaces Tom Bradbrook. Substitution, Bristol Rovers. Ellis Harrison replaces Matty Taylor. Attempt missed. Luke Daley (Dartford) right footed shot from outside the box is too high. Substitution, Bristol Rovers. Andy Monkhouse replaces Dave Martin. Attempt saved. Adam Cunnington (Bristol Rovers) right footed shot from the centre of the box is saved. Attempt missed. Matty Taylor (Bristol Rovers) right footed shot from the right side of the box misses to the right. Tom Bradbrook (Dartford) wins a free kick. Foul by Harry Crawford (Dartford). Substitution, Dartford. Ryan Hayes replaces Adam Green. Attempt saved. Max Cornhill (Dartford) right footed shot from outside the box is saved. Adam Green (Dartford) is shown the yellow card for a bad foul. Foul by Adam Green (Dartford). Attempt blocked. Luke Daley (Dartford) right footed shot from outside the box is blocked. Attempt missed. Lee Mansell (Bristol Rovers) header from the centre of the box is too high. Assisted by Dave Martin. Second Half begins Bristol Rovers 1, Dartford 0. First Half ends, Bristol Rovers 1, Dartford 0.